You must have a serious gray water tank! I am curious to know what you find out from the PO. "I wonder as I wander out under the sky..."
In between rigs at the moment. Ok, finally got around to seeing "where" the grey tank is and what the capacity is. 7 gallons, under the sink , behind the porta potty and partially behind the fridge. Im surprised with our option larger fresh water tank that we have never ever filled the sucker?.. seems odd. We've damn near emptied our fresh water tank and i've never had the sink not drain or have water come out the breather. I think our gw holding is about 4 gallons. I am having that replaced with a larger tank in January. We were supposed to have a large gw tank but that required mounting the spare on the bumper. The tire carrier was so ugly I changed things at the last minute and went with the smaller tank. It does get filled way too often. My wife will often bring water inside from an outside source for doing dishes and that contributes to the rapid fill. Draining the gw is a total hastle. SMB has a much better tire carrier now for the Sprinter so I decided it was time to change. We have 20 gallons fw and I think the bw tank is about 10 gallons - it never fills up. Draining it is easy but where SMB put the hose requires me to lay down on the ground to put it away. I am going to do my own system for that after the change. AdventureDuo I have the same setup, large fresh water tank and same grey water, same place. I've only filled the GW once and it was hard to do, but came out the drain on the side of the van. Maybe you're not using as much water as you think. 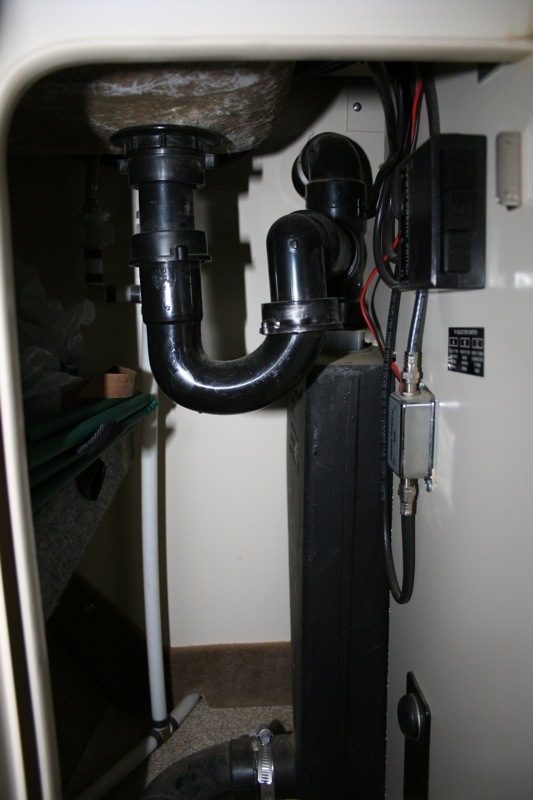 I would think mixing the black and grey water outlets would be a sanitary issue in an RV build as much as anything. Good to hear Jage. Thanks for the input. Re: Grey Water Tank ? we travel 3-4 months at a time and have a 7 gallon gray water tank. We avoid dumping it where people camp as that leaves residue that attracts bugs and flies. Usually dump it on a dirt road away from everything. To keep smell down and prevent long term grease buildup, we put our coffee grounds in the gray water tank. As we travel they scour the tank clean. When we dump the tank, we purge it twice with about a quart of clean water. Before the second quart completely drains, I close the gate valve, which seems to keep it cleaner. If the valve leaks, try cleaning it with a bottle brush. Close the gate valve a little and you can clean it also. Back to my trailer days, easiest way to keep black water tank clean is to drop a tray of ice cubes down the toilet 20 miles before you dump. They bump around and liquidfy everything. I called it a "blackwater cocktail!" I just realized the gray water tank under the 1994 E250 SMB I just purchased has a big chunk missing from a lower corner of it - A previous owner must have hit something, or it might of froze. Does SMB sell replacements for an old rigs like this, Or am I going to have to make one myself? Keep some water in the sink trap and you will never smell the grey water. Having a small grey water tank is seldom an issue. You can drain the grey water almost anywhere, even if you have to carry it to a toilet or other drain; but fresh water is not always available, so you need a large water tank. Call or E-mail SMB. Hopefully you can get it direct from the manufacture. Bump to an old thread.